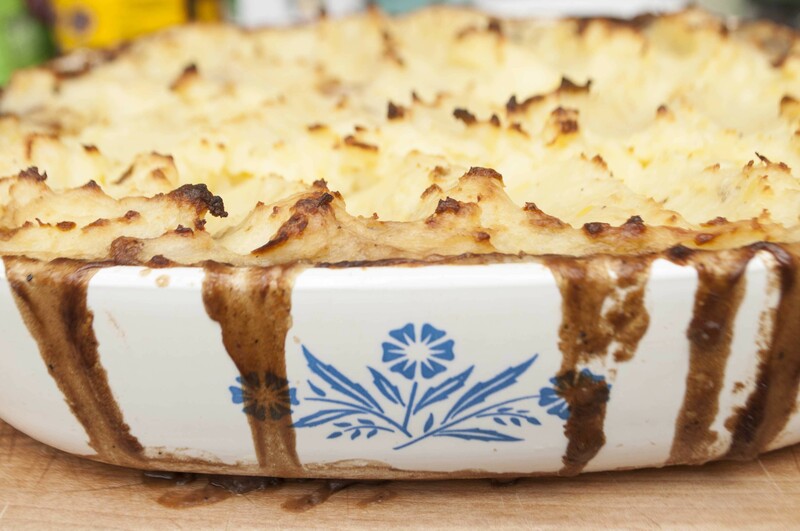 This is not your grandma's shepherd's pie. For St. Patrick's Day, I like to prepare something that honors my husband's Irish heritage. Last year around this time, I had a conversation with D.C. Irish chef Cathal Armstrong about St. Patrick's day cooking, which coincided with the release of his 2014 cookbook, My Irish Table. Armstrong's shepherd's pie lodged itself in my mind, with its hearty hunks of lamb and vegetables — it's not the ground-beef and potato thing you used to get for lunch in elementary school. On Sunday, I was driving through Shelburne and stopped at Green Pasture Meats, which happened to be selling local lamb stew meat, and a holiday dinner was born. I didn't use Armstrong's recipe, but I owe the inspiration to him. Boil the non-stew potatoes until they're soft. While the potatoes are boiling, prepare the stew. Season lamb with salt and pepper. Heat a bit of oil in a 10-inch skillet on high heat. Add the lamb and sear, taking care to thoroughly brown on all sides. Reserve any liquid in a bowl. Mix the flour, salt, pepper, and dry spices and set aside. When the lamb is cooked, place in a bowl and dredge in the flour/spice mixture. Rinse the skillet and sweat the aliums and celery over medium heat with two tablespoons of butter until they are translucent. Add the carrots and diced potatoes. Cover and cook, stirring occasionally, for 5-10 minutes. Preheat oven to 450 degrees and place a rack in the middle of the oven. Add the dredged lamb to the skillet and cook, stirring often, until the lamb no longer appears white with flour. Add the herbs and liquid ingredients, including any reserved liquid from the lamb, and simmer 20-30 minutes, until the liquid thickens into a spoon-coating sauce. As the stew is simmering, mash the potatoes with the butter and cream over low heat. When the potatoes are smooth, beat in the egg and season to taste with salt and pepper and set aside. Pour the stew into a 10-inch square or 9-by-12-inch baking pan. Carefully spoon the potatoes on top until the all the stew is covered. Place the casserole on a baking sheet (it may bubble over and drip a bit). Bake uncovered 25-30 minutes, until the peaks of the potatoes are toasty and brown. Let set 5-10 minutes after removing from the oven and serve straight away! Sweet, Sour, Salty, Bitter: This Dish Has It All! Let's All Fry Purple Potatoes!